It is not possible to do color correction without professional knowledge but for beginners it is important to learn color correction terms first. Vegas Pro is one of the best software tools for applying color correction on images/videos and the article below contains complete information about how to use Vegas Pro for color correction applications. For those who want to know all about the how to correct color in Vegas Pro, following details can provide complete information with examples. Vegas Pro is recommended for professionals due to its advanced user interface and higher price range. The sad part is that it can be used only on Windows devices, so if you are searching for something that can work on both Window as well as Mac devices then Wondershare Filmora is best answer for all your needs. This powerful tool is designed with easy to use software interface and it can be downloaded easily from official website of Wondershare Filmora. Some of you might have heard about the basic terms used in color signals that are brightness, hue and saturation. All of these play important role in every color image or video signal so it is necessary to be familiar with their basic definitions as well as their use in Vegas Pro. On software screen, go to View present at top left corner and then from drop down menu select Windows layouts, further you need to choose Color Correction. Actually Vegas Pro software possesses four different color/video scopes that can be used for different purpose as described in the table above. Vectorscope, Histogram, Waveform and RGB Parade provide complete analysis of video signal. With the help of these easy to manipulate tools users can adjust highlights, mid tones, shadows, gamma values, luminance values, hue and saturation, contrast and brightness as well as tonal range for the input signal. 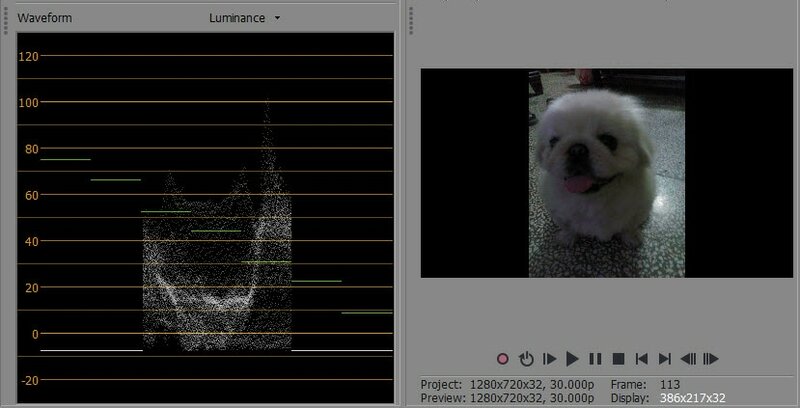 As already discussed in previous section, Vectorscope is used to provide information related to basic components of video signals that are saturation and hue. When a value lies at central position of this scope that means it have zero saturation and hue is also missing. As the values keep on moving far away from center point, the amount of hue and saturation into color signal gets added. The information one vectorscope scale are represented in terms of primary and secondary colors where red, green and blue belongs to first category and yellow, magenta and cyan are from second category. You can see that all the dots are around the centre on the Vectorscope and that means there are many different hues on this image, but they are not very saturated. Open the Video Event FX Window by clicking on the Event FX icon available on screen; then go to Vegas Color Corrector, hit Ok, then go for custom settings and finally increase saturation as per need. The effect will be directly observed on image as dots on Vectorscope will get more distributed away from center point. This tool denotes brightness related information. 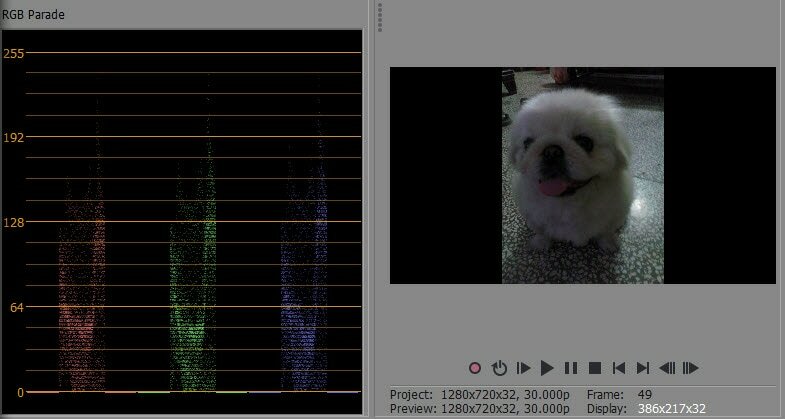 Observing things on waveform monitor while moving from left to right is same as looking on video preview window in the same direction. If more number of dots are vertically aligned then it represents higher value of brightness. Now we can see the photo already looks better and clearer than the original. 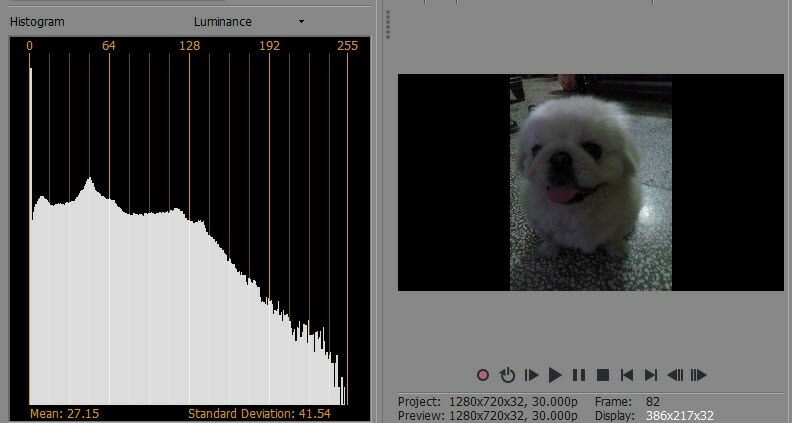 Histogram provides information about contrast and brightness. On this scale, the vertical lines ranging from left side displays black (0) leading to luminance information and it extends towards right side up to 255 that is extreme white representation. Height of these lines display amount of pixels used to represent any particular image along with luminance values. We can see from the Histogram that there too much Shadows and no Highlights of the original photo. RGB Parade tool is used to display information related to brightness of RGB colors. This scope can provide quick information about all brightness levels while showing effect of each main color individually. From the screenshot above, you can see a band of dots in the Shadow area. That means there are too much blacks and lack of highlights. The bottom handle slightly make the image closer to true white. The longer top handle I created at the top expands all the compressed dots that were locating in the lower mid-tone region and also at the same time increase the brightness of the whole video. If you want to know more about Sony Vegas, check this video to know how to apply a film look by using color correction tools in Sony Vegas Pro.